Enjoy your travels - to wherever they might be in whichever mode of transportation. Try the CGN cruise from Ouchy - the Tageskarte is valid to the French side and back. Last edited by jrspet; 01.02.2011 at 20:51. If someone hasn't already mentioned this. This app (WEMLIN) is superb for iphones and Zurich transport. It also comes in English. Just a little note when booking European journeys via the SBB website. Yesterday, I went to book a return trip in May from Zurich to Paris using the lowest fares for direct connections option, I selected the journey & price that I wanted & then it all got stuck in the seating reservations section, saying that any combanation that I wanted was unavailable - after going back & forth a few times, I decided to quit & start again. 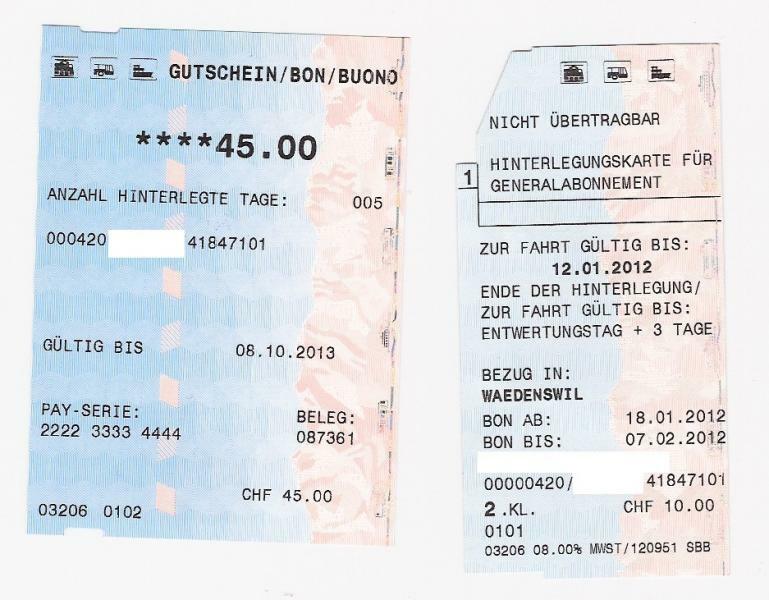 The exact same journey had now jumped in price by nearly 70 chf in that time!! - so I left it as I was passing ZHB later. I asked at the reiseburo what the deal was & they said that this often happens & nothing that they can do about it. This morning I tried again online & to my suprise the same journey was now 100 chf cheaper than the last one I got yesterday & seating res request no problem & I booked it all fine. Which leads me to speculate that mucking around back and forth with the seating reservation section somehow triggers the system to think that demand has suddenly gone up & it up's the prices as a result. The journy from Zurich HB to Lugano Railwaystation will take at least 2 hours and 37 minutes and there is no way you will make it to Lugano before 8:46 am. Your commute seems to be a little bit unrealistic to me. Conserning the travel pass: A GA will be the cheapest solution. 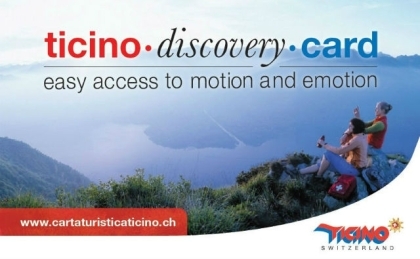 For a student (under 30) it costs CHF 2400 annually or CHF 225 in monthly rates (4 month minimum). For parents: In addition to buying the half-fare card ("demi-tarif") for yourself, make sure to buy a "carte junior" for your children, age 6-15. 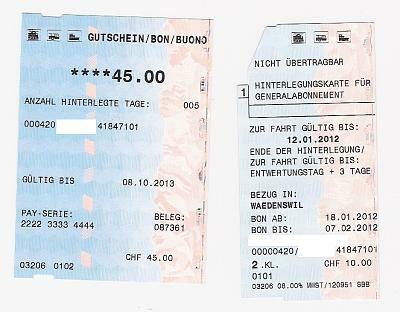 For a modest fee (I think it was CHF 40) your children can travel for free with a parent for the whole year. This covers travel on buses, trains, boats, cablecars, etc. Of course, if your children are not with you, they have to pay regular fare. If two parents each have the demi-tarif and your kids have the carte junior, your whole family can travel for the price of a single adult. Yeah, are you guys sure that you got your info right? And can i have a bit more info on this tagskarte, I have family in swiss. GA Owners - deposit your GA if not needing it for 7 consecutive days or more, and obtain an SBB Bon ( which can be used for most SBB products and service, including for renewal of the GA ). Max deposit term is 30 days, with a fee of CHF10 per instance. Once you have deposited it in any ( or to the closest ) SBB office, you get a temporary ticket ( Hinterlegungskarte ) valid in the interim, to the airport and back for example. 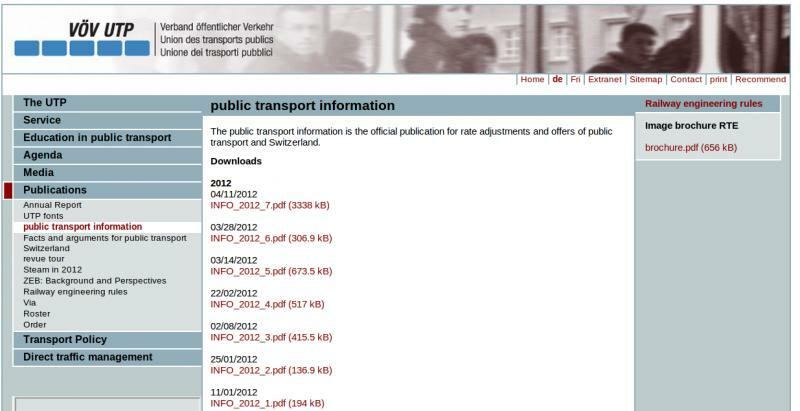 Attached is a PDF file showing more routes / operators accepting the the GA for cost free travel. Gleis 7 Card remains unchanged however. The cards, which are reusable for environmental reasons, can be purchased at the counters of the transport companies, the FFS, as well as travel agencies, affiliated hotels and local tourist offices, from Easter 2012. A simple contest to stand a chance to win 1 of out 10 Ticino Discovery Cards. Participation in the competition requires the approval of the conditions of participation. The contest is limited to a subscription. If a person participates in the competition several times, all records sent with the same name or e-mail address will be deleted and the participant will be excluded from the draw. The winners will be contacted via e-mail. In relation to the competition there will not be entertained any correspondence. The legal recourse is excluded. Last edited by jrspet; 24.03.2012 at 11:33. The Albis day pass is particularly good-value for those wishing to take daytrips and walking tours to the Albis-Felsenegg-Uetliberg region, as well as those wishing to explore the Sihl- and Reppischtal, the city of Zurich, or the lake for a short cruise. This ticket is valid for 24 hours in zones 10, 50, 51, 54 and 55. You pay for just 4 of these 6 zones. 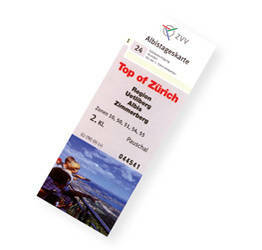 You can validate your Albis day pass from any location in the ZVV network. This gives you complete freedom to get into, as well as move within, the zones listed above. Don't forget MOBILITY : car-sharing or rather car-on-demand: the cheapest solution for a second/occasional car . 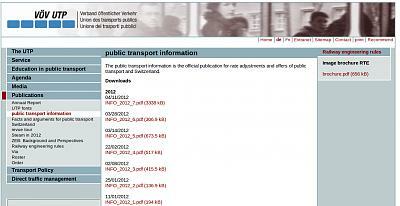 http://www.voev.ch/oV-Info.html - Temporary changes and offers, worth checking out once a month. More in the enclosed PDF in all national languages. UBS is celebrating its 150th anniversary ( 25th June 2012 ). 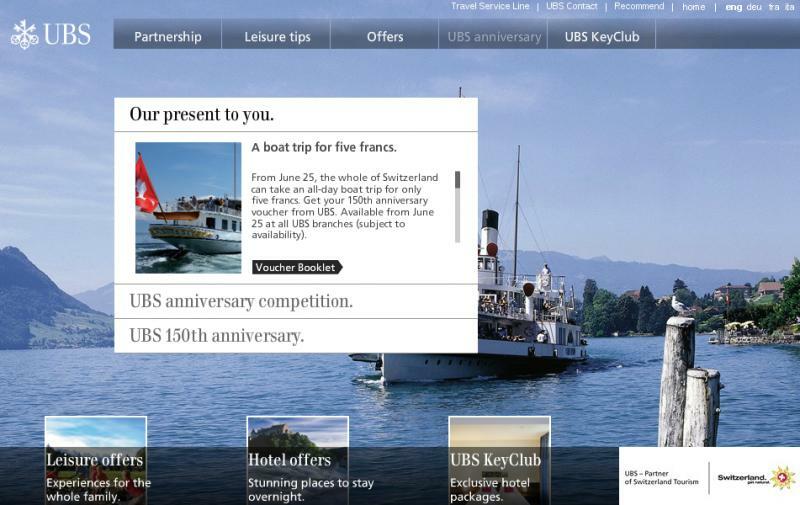 On this occasion for a limited time, anyone can on 25 June at all UBS branches in CH obtain a coupon booklet. 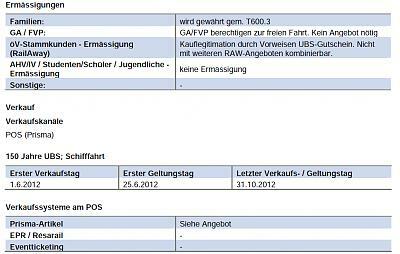 It is not necessary to have an account at UBS. The Coupon books include a voucher to purchase one of the cruise ride day ticket for only CHF 5 - to most Swiss lakes and rivers ( as per www.vssu.ch ). The campaign: "For a whole day riding gently on the ship." More in national languages in the enclosed PDF. CHF49 ( of CHF69 ) same day return trip from any NthWest CH station to Karlsruhe, DE, independent of train selection ( OK to board an ICE train too, only other cost is CHF5 extra if you need a seat reservation per train ), does not dependent on any existing Abonnement, valid from 18.06.2012 to 19.08.2012.
plus others detailed in the attached PDF. 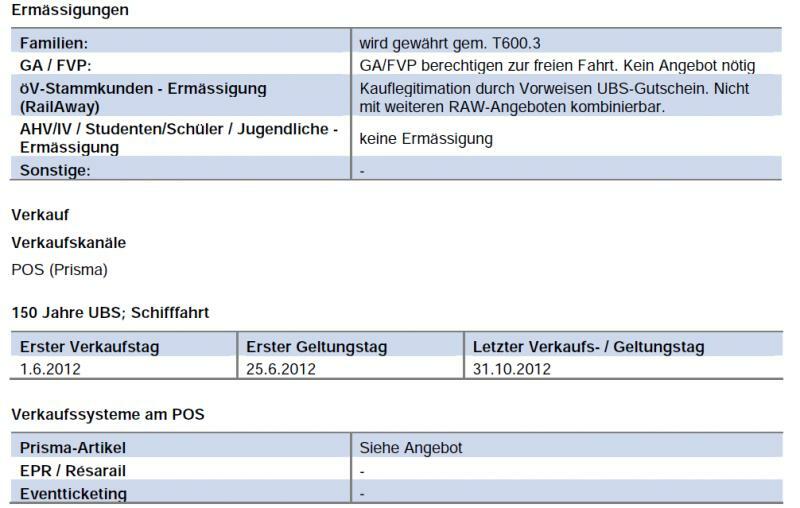 Enclosed PDF in German describes the GA history. JRSPET, YOU are the KING of transportation knowledge! I am impressed. Thank you!